Laser Vision Correction (LVC) has been around for about 25 years. The first technique used was PRK (photorefractive keratectomy), which worked very nicely but caused some discomfort and took some time for full visual recovery. The next generation of LVC was LASIK, which is a more popular procedure because of the rapid visual recovery and minimal discomfort. Today most laser institutes offer both procedures, because LASIK isn’t appropriate for about one-third of patients. 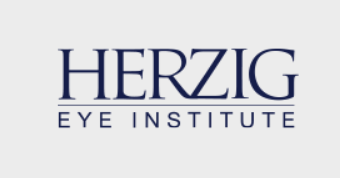 The newest generation of LVC is called SMILE, available in only a few institutes in Canada including the Herzig Eye Institute. SMILE is an acronym for SMall Incision Lenticule Extraction, and as the name suggests, the procedure is done with the least disturbance to the surface of the eye. While PRK and LASIK are excellent and safe procedures, SMILE has distinct advantages over these two first- and second-generation procedures. Firstly, because the surface of the cornea is almost untouched and there is less disturbance of the corneal nerves, there is much less chance of prolonged dryness of the eyes. Dry eye is the most common issue associated with PRK and LASIK, so to be able to eliminate or reduce this as a postoperative problem is a huge step forward. Next, and perhaps most important, is the area in the cornea from which tissue is removed with the SMILE procedure. 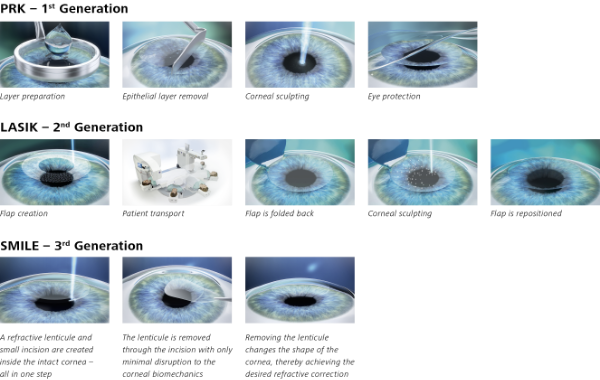 Both PRK and LASIK remove tissue from the strongest part of the cornea, on or near the front surface of the cornea. This does weaken the structure of the cornea slightly. The SMILE procedure removes corneal tissue from a deeper, less dense area of the cornea, so that more of the corneal integrity is maintained. This is particularly important for patients with thin corneas who typically are treated with PRK. Most of these patients who were not candidates for LASIK can now have SMILE, allowing them to recover as quickly as LASIK. I recently saw a young man who had thin corneas and had been seen in consultation at two other laser institutes. Because they didn’t have the technology for the SMILE procedure, he was only rightly offered PRK. When I saw him, I felt that he was an excellent candidate for SMILE. Another patient I examined had a history of dry eyes with her contact lenses and was unable to continue wearing them. Clearly, she was at higher risk for postoperative dry eyes. With the SMILE procedure, that risk was virtually eliminated. As with all medical procedures and technologies, there continue to be refinements and improvements to improve outcomes and safety. I have always been a believer in offering my patients the best technique and technology, once proven safe, to correct their vision. PRK and LASIK have improved over the last 25 years, but SMILE is the latest generation in the evolution of LVC, and it has distinct benefits for my patients. Learn more about this next-generation procedure. DOWNLOAD this free 7-page SMILE brochure.